NPR, PRX, PRNDI and member station representatives from Minnesota Public Radio and St. Louis Public Radio brought the Culture of Journalism discussion to PRPD’s Public Radio Content Conference this month in Austin. 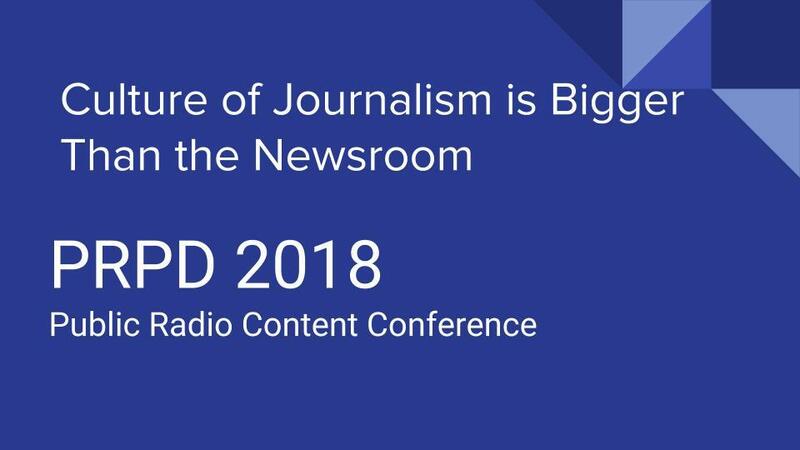 Tamar Charney, Managing Editor of NPR One, moderated a panel discussion which included Mark Memmott, NPR’s Standards and Practices Editor, Nancy Cassutt, Executive Director of News and Programming at MPR and John Barth, Chief Content Officer at PRX. The coordinated effort seeks to bring member stations and NPR together on a common set of standards and practices for the content produced across the public media system. It’s also an attempt to raise our expertise and ambition as a group and work together to discuss problems that stand in our way. Those principles resonated in a packed hotel conference room last week, where many of those who are in charge of programming and content at member stations had a chance to weigh in. John Barth began the discussion by laying out the collaboration’s basic goals, but the bulk of the discussion focused on case studies that have recently challenged journalism ethics and newsroom leadership. Nancy Cassutt shared her experience of coordinating in-house coverage at Minnesota Public Radio of her network’s reaction to sexual harassment allegations against Garrison Keillor. Cassutt described the firewall she had to create between the reporters on her staff covering the story and MPR’s leadership. Mark Memmott introduced several case studies for discussion, including whether both journalists and non-journalists working at member stations should be allowed to participate in political protests. How social media is used inside and outside the station dominated the discussion. Many stations are grappling with the task of putting social media policies in place that protect the journalistic integrity of their operations. John Barth made the point that it’s almost impossible for a person identified with a station to separate her professional social media identity from her private one. Among the questions raised by the audience was whether journalists can stand up for a free press and the First Amendment. Memmott’s short answer was yes, journalists can ethically stand up for and stand behind the work they do. Earlier this month, newspapers across the country published editorials fighting back against attacks from President Trump, who has criticized journalism as “fake news” and cast reporters as the “enemy of the people.” NPR and many member stations chose not to participate, but PRNDI did issue a supporting statement along with RTDNA and other organizations that support broadcast journalists. The Q&A portion of the discussion brought more issues to wrestle with. Many member stations are licensed by large universities that are often their top governing authority. Several station program directors expressed a need for training on how to work with university licensees, especially when it comes to building a firewall that protects the station’s journalistic integrity. Another program director suggested training around vetting social media content for accuracy. She used the example of images used over social media networks not being authentic and that many stations don’t have teams to help verify the accuracy of this kind of content. Another program director suggested that stations use the Culture of Journalism project to create some sort of accreditation; a set of standards that stations would have to meet to work with the network and collaborate with other stations. And if stations did not meet these standards, there could potentially be some kind of punitive action. John Barth suggested at this point that a set of standards for stations could help identify challenges that could then be overcome with the help of others. He emphasized that inclusion is very important and that the Culture of Journalism effort is not about excluding stations. In the next couple of weeks, the Culture of Journalism team will be sending out the first of several surveys to station news directors. The first surveys will ask questions focused on ethics, leadership and talent. We’ll use the insights we collect to help focus the conversation around training and resource needs across the system. The discussion will continue at the Super Regional Conference in October, where station General Managers will gather.